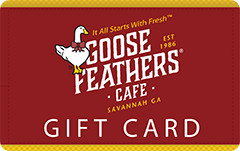 Check out “Foodie in Savannah, GA” on the Sisterhood of the Travelers site to read about their Goose Feathers experience! Goose Feathers Cafe featured in the South’s Best Bread Pudding article by Taste of the South magazine. Check out the article here! Goose Feathers Cafe is the the recipient of the 2013 TripAdvisor Certificate of Excellence Award! Yahoo’s Associated Content featured us in their article Best Bakeries in Savannah, GA. <- Click the link to read more! We’ve recently been reviewed by Connect Savannah. Click here to check it out!